This Baked Macaroni and Cheese comes together quick and easy. 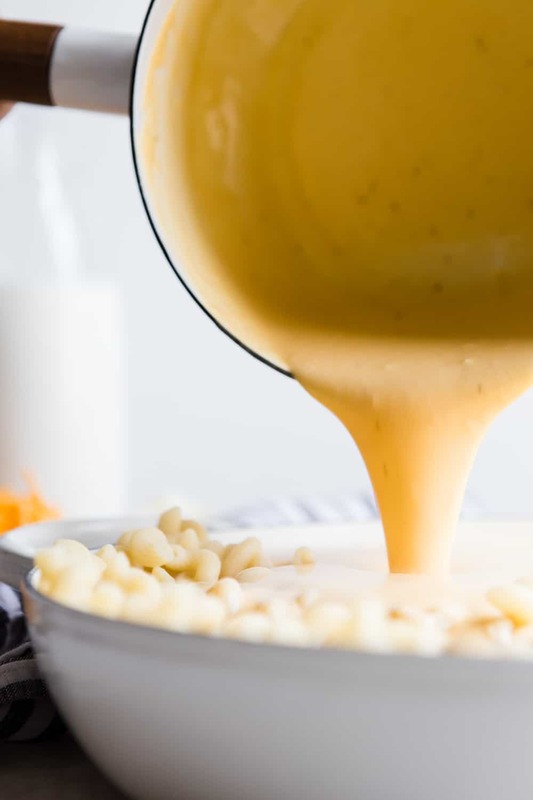 Homemade cheese sauce generously covers noodles and is baked to a rich, bubbly, golden brown perfection. When served with a hearty side of veggies, this indulgent dish becomes the perfect weeknight meal. Hi there! I’m Holly, one of the two ladies that make up The Modern Proper. Today, I’m so excited to share with you one of my most beloved recipes, Baked Macaroni and Cheese. 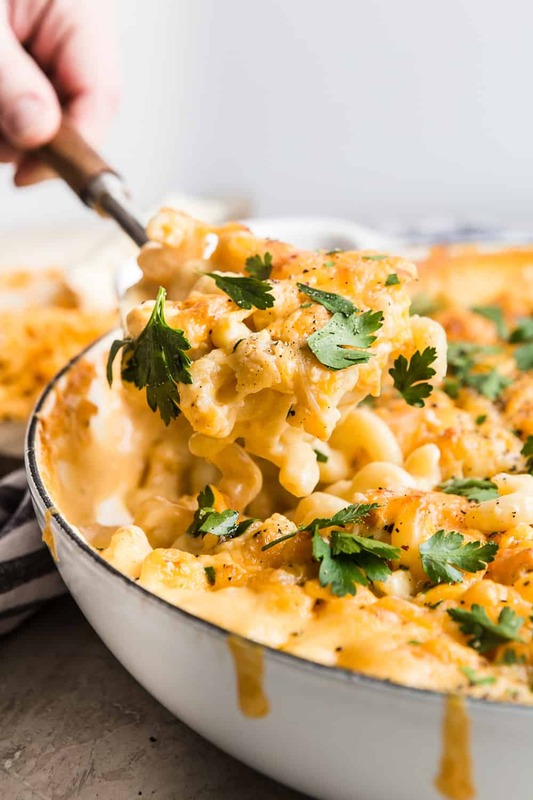 This is a no frills, straight up, honest to goodness, classic Baked Mac and Cheese recipe that you’ll happily come back to time and time again. 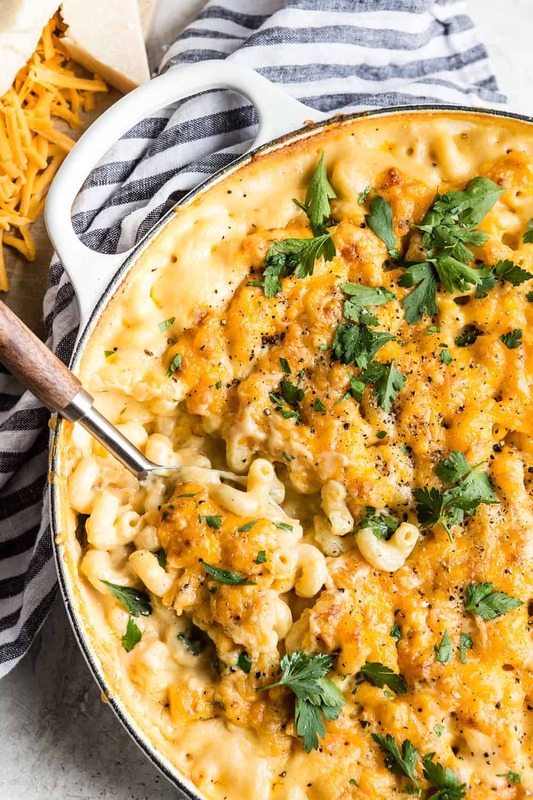 I know that feeding your family healthy dinners is on everyone’s minds these days and the thought of mac and cheese sounds less than well rounded, but fear not! I always serve this dish with a hearty side of veggies. Everyone leaves the table satisfied and my kids hardly even complain about all the greens on their plate, because it’s accompanied by the carb-laden, cheesy good stuff. They’re happy, I’m happy, it’s a real win, win. HOW DO YOU MAKE HOMEMADE MACARONI AND CHEESE? Homemade mac and cheese starts with a flour/butter mixture called a roux. You melt the butter, add the flour and whisk until it becomes thick. Then you slowly, slowly add the milk. Warming the milk up a bit first helps keep the sauce thick, and it takes less time to heat up to a simmer. If combined properly, your roux/milk mixture should be rich and creamy once all the milk has been incorporated. Next, add the cheese and a few flavor boosters and pour that creamy goodness over cooked noodles and pop it in the oven to bake. DO YOU COVER YOUR MAC AND CHEESE IN THE OVEN? You may also be wondering if it is necessary to cover your Macaroni and Cheese in the oven. I personally love the crispy bits of cheese that form on the top layer that result from NOT covering the mac and cheese. Since the noodles are pre-cooked, you are really just popping it in the oven to get all bubbly and thick throughout and brown and crispy on top, but ultimately, the choice is up to you. As you’ll see in this recipe, I’ve added a few extra optional flavor boosters to keep things interesting. But I must say, the garlic powder is an absolute must! For years, people have asked me what I put in this mac and cheese that makes it so good. Well, guess what? The garlic powder is my secret! Recently, I’ve begun adding a little nutmeg and mustard powder to the sauce as well. While these are most definitely optional, I don’t think you’ll regret adding them in the slightest. I also love serving the finished product with some sriracha, for an added kick. My kids aren’t fans, but my husband and I sure love it. 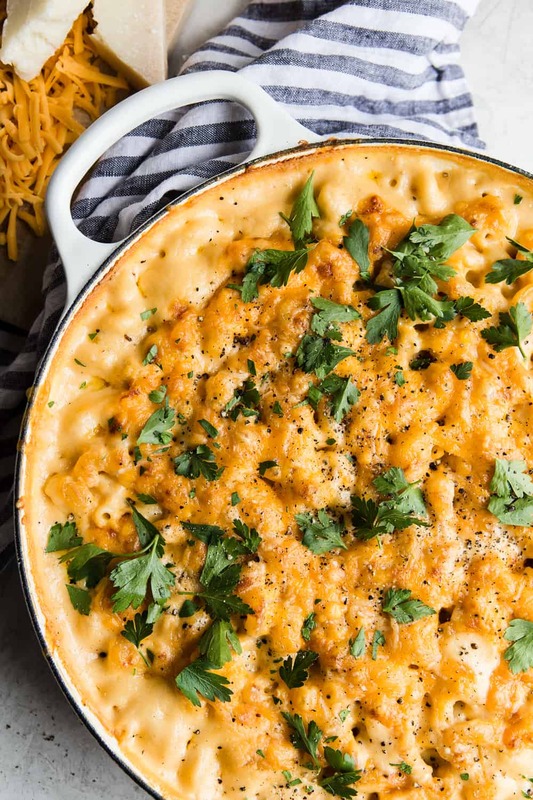 So, the next time you’re looking for a fairly simple and extra delicious weeknight dinner for your family or guests, I highly recommend whipping up this easy Baked Macaroni and Cheese. You’ll make a lot of tummies happy! 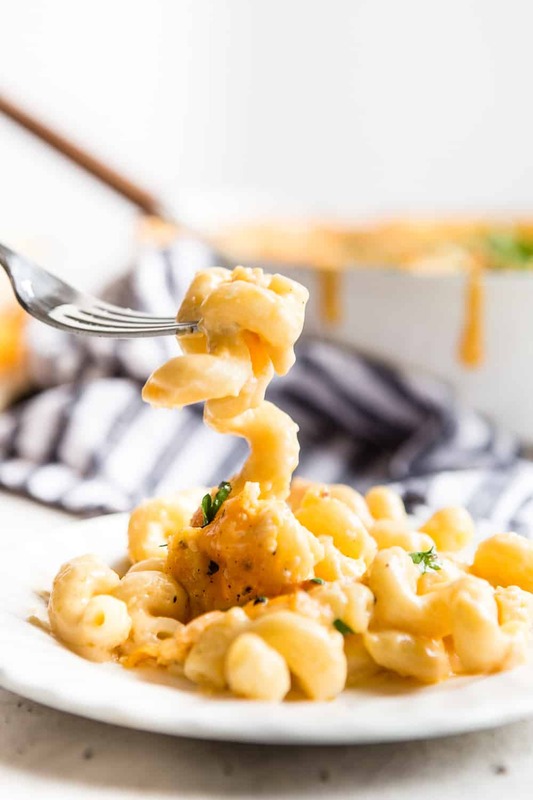 If your time is limited you could always opt for this 4 Ingredient Stovetop Macaroni and Cheese or this Slow Cooker Mushroom Macaroni and Cheese. Heat oven to 400 degrees with rack in the middle of oven. Melt butter in a large saucepan over medium heat. Add flour to melted butter and stir until thickened, about 3 minutes. Slowly whisk in milk a little at a time. The slower you add the milk the thicker the sauce will be. Stir in 1 pound of cheddar cheese and ½ cup parmesan cheese into the sauce. Reserve 1½ cups cheddar and ½ cup parmesan for the top. Add salt, pepper, garlic powder, mustard powder and nutmeg to the sauce, stir until combined. Stir together the cooked macaroni noodles and the sauce and transfer to a 9 x 13 baking dish, that has been prepped with cooking spray if needed. Sprinkle with remaining cheese and bake in the oven until golden and bubbling, 20-25 minutes. Sprinkle with flat leaf parsley if desired.